Relative humidities of around 70% are ideal for many plant species. Humidity at this level allows for satisfactory growth rates, and is low enough to prevent many fungal diseases. Transpiration is the process responsible for distributing water and nutrients throughout the plant. To maintain active growth a plant must be able to transpire easily. High humidity restricts the transpiration rate because the air is less able to absorb the water vapour that is trying to escape (i.e. transpire) from the leaves. Once the air's capacity to absorb extra water is reached, it is 'saturated' (i.e. 100% RH). At this point the plant essentially stops transpiring which causes the supply of water and nutrients to cease. In cucumbers and tomatoes this results in symptoms such as 'blossom-end rot'. This is due to a calcium deficiency at the plant's extremities. When transpiration has ceased (i.e. 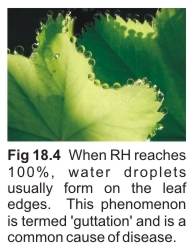 where RH = 100%) it is common for water droplets to form on the edges of the leaf. This phenomenon is termed 'guttation' (Fig 18.4). This is able to occur because the plant is able to pump water by root pressure - but only if the nutrient concentration is low enough and the temperature is sufficiently high. If guttation occurs regularly it will become evident by the formation of small white salt deposits on the edges of leaves. Subsequent osmosis will cause localised burning (i.e. necrotic spots). These points are vulnerable to botrytis and many other fungal diseases. When the humidity falls and transpiration continues the water droplets are reabsorbed into the plant, drawing with them any fungal spores that may be present. How to minimise humidity in a grow room or greenhouse? ● Air exchange via ventilation: The very act of transpiration causes humidity to rise. The growing area must therefore be well ventilated to keep the humidity relatively constant and allow the transpiration rate to continue unhindered. To achieve this, the humid air must be regularly discarded and replaced with drier air. Although colder outside air may have an RH of 100%, once it is drawn inside and its temperature is increased via artificial heating, its RH will drop significantly. Good air exchange will also help ensure oxygen and carbon dioxide levels do not become depleted. ● Minimise plant density: The more plants there are in a given area, the quicker the humidity will rise. Ventilation rates must be increased with increases in plant density. ● Optimise air temperature: As the temperature of air increases then its ability to hold more water also increases. For example, you can lower the RH of a 15OC (59OF) body of air from 100% to 55% by heating it to 25OC (77OF). Also, for a given level of RH, plants can transpire more freely when the temperature is high. For example, at 25OC (77OF) and 80% RH, the plant can transpire 5ml of water per cubic meter of air before 100% RH is reached. Alternatively, at 15OC (59OF) and 80% RH, the plant can only transpire 2ml of water per cubic meter of air before 100% RH is reached. Obviously to minimise humidity it would be best to have the temperature set as high as possible, however, in order to optimise photosynthesis it is necessary to set the temperature no higher than around 25OC (77OF) during daylight hours and then 5OC (10OF) cooler at night. 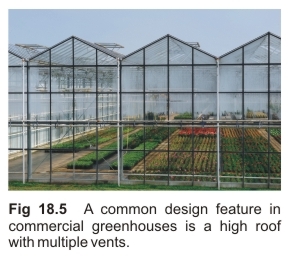 ● Circulate air within the greenhouse: To ensure uniformity of humidity, oxygen and carbon dioxide within the greenhouse itself, the air must be circulated by use of a fan. What is 'Relative Humidity' (RH)? Humidity is best described in terms of 'relative humidity' (RH). RH is simply the ratio, expressed as a percentage, of the amount of water in the air to the amount that it can hold when saturated. For example, 1 cubic meter of air at 30OC can hold a maximum of 30ml of water. Therefore when it contains 15ml (at the same temperature) it has a RH of 50% and when it contains 30ml of water, its RH is 100%. Note, at 10OC, one cubic meter of air holds 10ml of water. With each 10OC rise in temperature air holds a further 10ml.